In more recent times, the essence of the gatekeeper's role has moved to the 'boundary spanner' - a systems thinker who understands the specific needs and interests of the organization and whose greatest asset is their ability to move across and through the formal and informal features of the modern organization. There are many types of boundaries associated with an organization, for example, horizontal, (function and expertise), vertical (status, hierarchy), geographic, demographic, and stakeholder. Boundaries are "the defining characteristic of organizations and, boundary roles are the link between the environment and the organization" (Aldrich & Herker, 1977) with functions crucial to the effectiveness and success of the organization. Despite being a critical success factor for an organization, beginning in the 1970s, the term - 'boundary spanning' has had an intermittent research history: there has been no systematic body of research that has evolved over time. This book aims to invigorate, excite, and expand the literature on boundary spanning in a diverse range of disciplines such as sociology, organizational psychology, management, medicine, defence, health, social work, and community services. 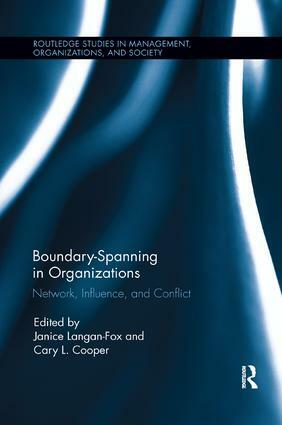 The book serves as the first collection of reviews on boundary spanning in organizations.